MDC leader Nelson Chamisa on Friday afternoon caused a stir at Rudhaka Stadium in Marondera after he unexpectedly appeared at the venue where Mashonaland East Provincial elections were underway. The process came to a halt as MDC members who were participating in the process ran to see the vibrant youth leader whose visit was described as a move to canvas for support for the presidential position that is also being eyed by secretary general Douglas Mwonzora. 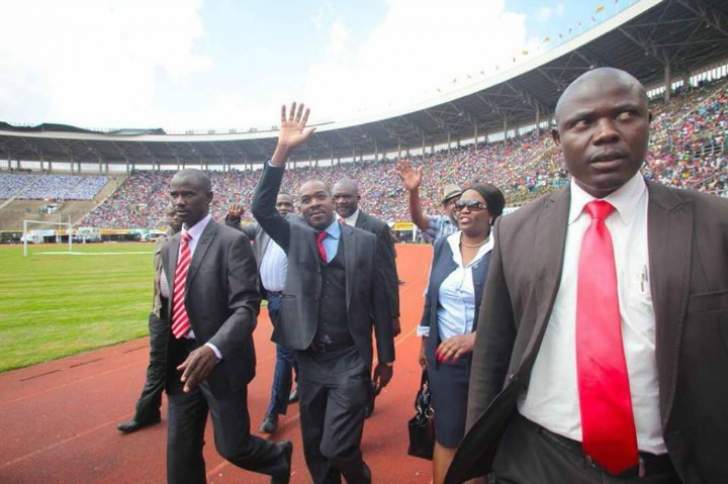 In his four-minute address to the delegates at Rudhaka Stadium, Chamisa said it is high time he take off the late leader Morgan Tsvangirai's "jacket" and put on his own. "This is not a rally, but I just said let me pass and see what is happening. Thank you for the non-violence (process), thank you for the peace. I have no doubt that the voting process you have just done reflects your will. Let's choose a leadership that is capable. I was putting on Tsvangirai's jacket until the congress. But after that you are going to give me mine," he said to wild cheers. The 41-year-old politician also took a swipe at President Emmerson Mnangagwa, accusing him of failing to steer the country as reflected by the increases in prices of basic commodities. Chamisa was endorsed by the province as their presidential candidate, while Tracy Mutinhiri, Tendai Biti and Morgen Komichi were nominated for the deputy presidency. The province nominated Thabitha Khumalo as chairperson. The election process was led by Highfield West legislator Happymore Chidziva.